On 29 January 2019, the United Nations Volunteers (UNV) programme and the United Nations Office for South-South Cooperation (UNOSSC) signed the first ever Memorandum of Understanding between the two organizations. This Memorandum of Understanding aims at fortifying an already strong collaboration between both entities, which will have its next milestone during the upcoming celebration of the BAPA+40 conference that will be held in Buenos Aires, Argentina, from 20 to 22 March 2019. 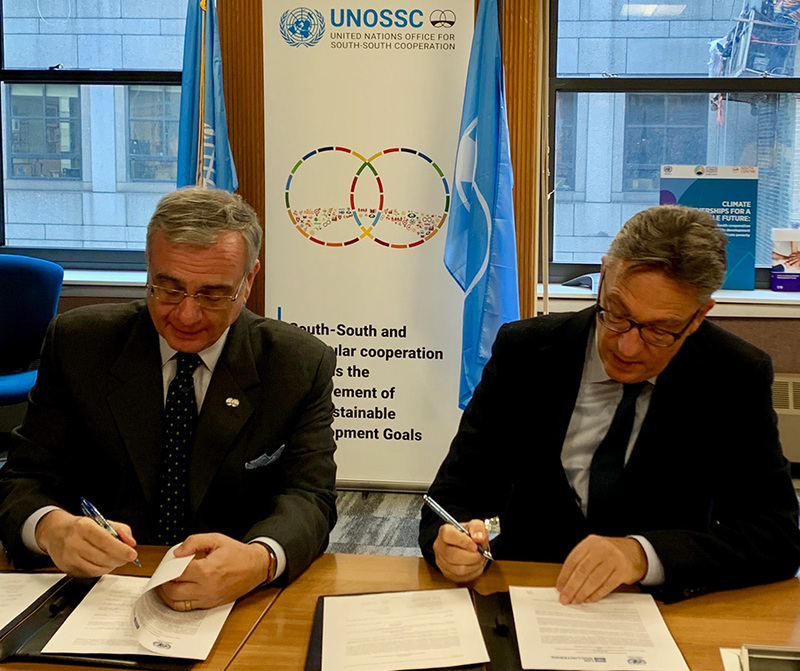 UNV Executive Coordinator Olivier Adam (right) signs a Memorandum of Understanding with Mr Jorge Chediek, UNOSSC Director and Envoy of the Secretary-General on South-South Cooperation in New York, United States of America. The Memorandum of Understanding was signed by Olivier Adam, Executive Coordinator of UNV, and Mr Jorge Chediek, UNOSSC Director and Envoy of the Secretary-General on South-South Cooperation. In line with UNV’s Strategic Framework 2018-2021, this alliance sets an unprecedented opportunity for both organizations to contribute to the implementation of the 2030 Agenda for Sustainable Development by promoting volunteerism and engaging volunteers for South-South and Triangular Cooperation. The history of UNV is rooted in South-South and Triangular Cooperation through the deployment of international UN Volunteers from the global South to support the work of the UN globally. Today, 83 per cent of all UN Volunteers come from and work in countries of the global South, sharing their knowledge while also gaining valuable experience through their assignments, for example by serving as UN Volunteers in peace operations. UNV and UNOSSC signed a Memorandum of Understanding to work on strengthening the recognition of volunteerism as a key element in the success of South-South Cooperation. Volunteering & South-South Cooperation share common ideals that make them perfect partners: solidarity, respect & equality. Moreover, in the most recent history, UNV and UNOSSC have collaborated to ensure the positioning of volunteerism as a driving force to achieve the Sustainable Development Goals. Some good examples of this recent successful cooperation were highlighted at the Global South-South Development (GSSD) Expo 2018. During the Expo, UNV showcased the concrete results delivered by volunteerism to South-South and Triangular Cooperation at the Fifth Networking Forum for the Arab States and the Europe and CIS. UNV also presented evidence on how volunteerism contributes to reducing poverty and generating opportunities for younger generations through Youth Entrepreneurship for Sustainable Development, fostering exchange of expertise and addressing gender gaps. The Memorandum of Understanding will enable the continued promotion of UN Volunteers as a talent solution for the UN and its Member States, to further generate cutting-edge research and evidence on the contribution of volunteerism to South-South and Technical Cooperation. It will also enable the development of joint initiatives to position volunteerism as an integral component of the same, as has been showcased already in the Good Practices in South-South and Triangular Cooperation for Sustainable Development, Volume II, published by UNOSSC in 2018.